Art Plates oversized double gang rocker (decora) switch plates are ideal for covering up uneven openings around the electrical box, chipped drywall, and marks on the wall that are left over from standard size switch plates. 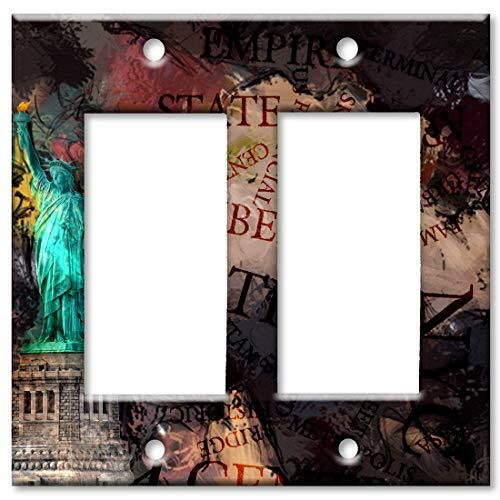 Art Plates painted over size two gang rocker (decora) switch plates are created using a special, high resolution, ultra violet printer that prints directly on our American made, heavy duty, oversize metal switch plates. 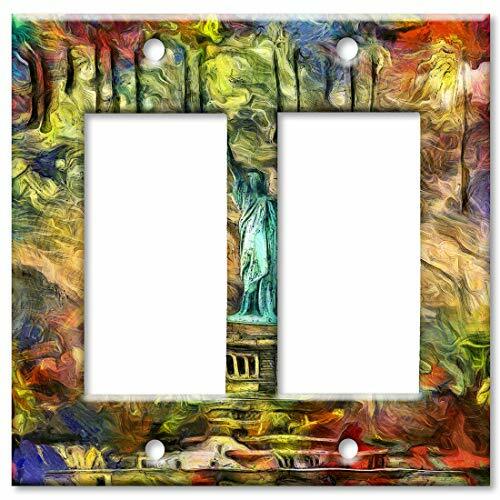 There simply are no other decorated over sized 2 gang rocker (decora) switch plates available that can compare to the richness of color and resolution that Art Plates can achieve. They look as if they were hand painted. Every decorative double gang rocker (decora) wall plate has a final UV cured high gloss finish. This creates an extremely durable shiny finish that also helps protect it from abrasions and scratches. Color matched screws are included. Art Plates switch plate are 100% made in the USA. Art Plates single gang toggle decorative switch plates are ideal for changing out boring, plain switch plates. Art Plates painted 1 gang toggle switch plates are created using a special, high resolution, ultra violet printer that prints directly on our American made, heavy duty, metal switch plates. There simply are no other decorated switch plates available that can compare to the richness of color and resolution that Art Plates can achieve. They look as if they were hand painted. Every decorative one gang toggle wall plate has a final UV cured high gloss finish. This creates an extremely durable shiny finish that also helps protect it from abrasions and scratches. Every switch plate comes beautifully and professionally packaged in see-through blister packaging and are great for gift giving. Color matched screws are included. 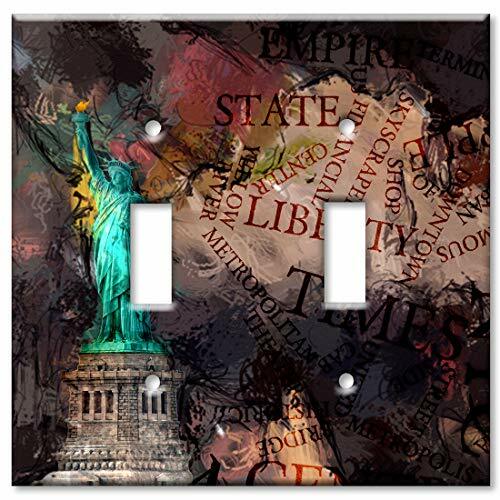 Art Plates switch plate are 100% made in the USA. Art Plates Double gang toggle decorative switch plates are ideal for changing out boring, plain switch plates. Art Plates painted 2 gang toggle switch plates are created using a special, high resolution, ultra violet printer that prints directly on our American made, heavy duty, metal switch plates. 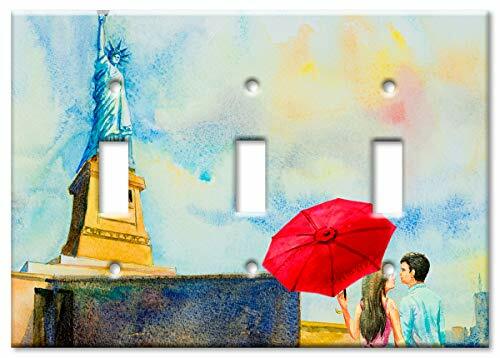 There simply are no other decorated switch plates available that can compare to the richness of color and resolution that Art Plates can achieve. They look as if they were hand painted. Every decorative two gang toggle wall plate has a final UV cured high gloss finish. This creates an extremely durable shiny finish that also helps protect it from abrasions and scratches. Every switch plate comes beautifully and professionally packaged in see-through blister packaging and are great for gift giving. Color matched screws are included. Art Plates switch plate are 100% made in the USA. 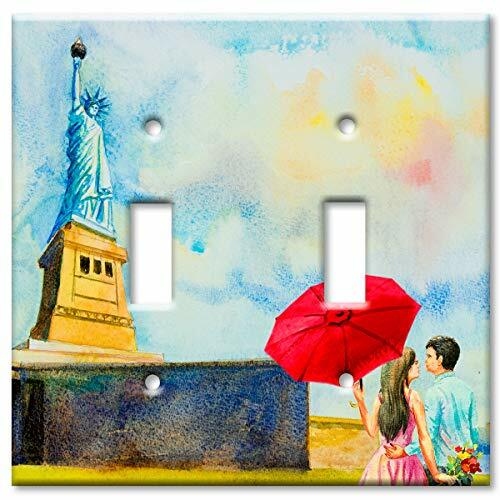 Art Plates single gang outlet cover decorative switch plates are ideal for changing out boring, plain switch plates. 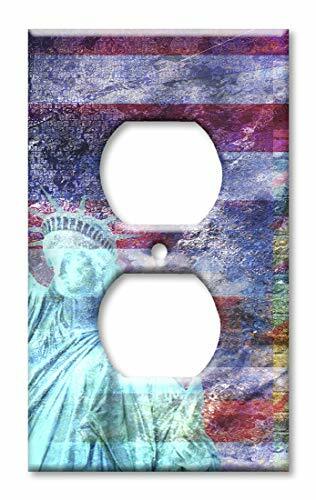 Art Plates painted 1 gang outlet cover switch plates are created using a special, high resolution, ultra violet printer that prints directly on our American made, heavy duty, metal switch plates. There simply are no other decorated switch plates available that can compare to the richness of color and resolution that Art Plates can achieve. They look as if they were hand painted. Every decorative one gang outlet cover wall plate has a final UV cured high gloss finish. This creates an extremely durable shiny finish that also helps protect it from abrasions and scratches. Every switch plate comes beautifully and professionally packaged in see-through blister packaging and are great for gift giving. Color matched screws are included. Art Plates switch plate are 100% made in the USA. Art Plates switch plates are ideal for changing out boring plain switch plates. Art Plates switch plates and outlet covers are created using a special, high resolution, ultra violet printer that prints directly on our American made, heavy duty, metal switch plates. There simply are no other decorated switch plates available that can compare to the richness of color and resolution that Art Plates can achieve. Every decorative wall plate has a final UV cured high gloss finish. This creates an extremely durable shiny finish that also helps protect it from abrasions and scratches. Every switch plate comes beautifully and professionally packaged in see-through blister packaging and are great for gift giving. Color matched screws are included. 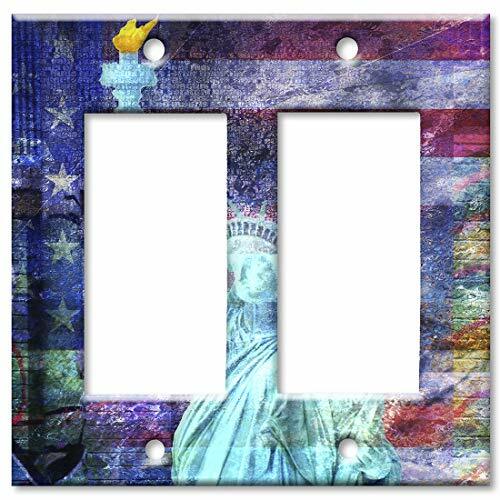 Art Plates switch plate are 100% made in the USA. 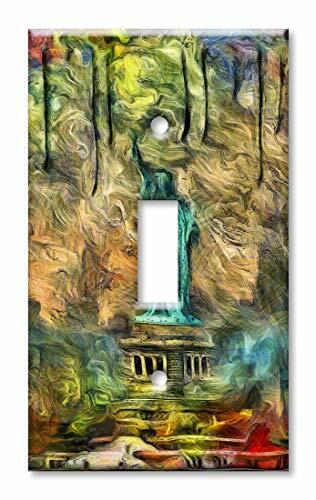 Want more Statue Of Liberty Faceplate similar ideas? Try to explore these searches: Cutter Light, 18k Gold Plated Band, and Keiti Swing Arm Spool.